If you want to get the most out of your garden with a soupçon of style, consider copying the French. That’s what Linda and Steven Brombal did at their home in Newport Beach, California, and the whole family is delighted with the results. Their kitchen garden, inspired by the classic French potager, feeds the family and provides an outdoor room that looks très joli. 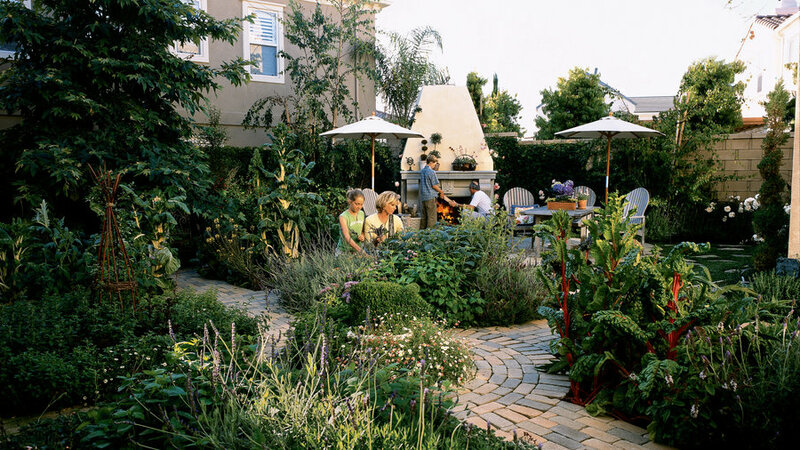 The Brombals chose this type of garden because they wanted to experiment with growing vegetables and herbs at their Provençal-style tract home. Since this space would also be their primary outdoor-living area, they planned out a yard that would be attractive and easy to maintain. As in a classic potager, the Brombals’ crops grow in small rectangular, square, and circular beds separated by walkways. The little plots and generous paths make weeding, watering, harvesting, and other chores accessible. And the geometric patterns add order to the garden. In their garden, the Brombals have had great luck with different kinds of lettuce, turning 11-year-old daughter Sydney, who didn’t eat salads before, into a greens lover. Linda didn’t alter her salad-dressing recipe ― it’s still olive oil, champagne vinegar, and freshly grated Parmesan.”But now the chives or scallions I add are right out of the garden,” she says of the dressing she pours over just-picked lettuce. There are also some permanent plants in the beds ― mostly aromatics like lavender and salvia. Linda has always used herbs in her cooking, but now that they’re growing right outside her kitchen door, she uses them more spontaneously. No wonder the Brombals don’t have a problem getting Sydney and 12-year-old son Morgan to settle down for family dinners. When the family moves a meal outdoors, dining together gets even easier ― and cozier. “We light the fireplace and bring out candles,” Linda explains.